The simple change of study habits can completely change your results in school. Learn these brilliant study hacks so you can graduate at the top of your class! Are you wasting your time when you study? On average, high school students spend about 17.5 hours a week completing homework. College students need almost double the time and can expect to spend anywhere from 14 to 27 hours reviewing classroom material. Pressuring yourself to spend a long time studying can have a negative effect on your ability to learn. New information is suggesting that studying less might be the answer to learning more. Researchers found that students who took regular breaks were able to remember more from a lecture than those who didn’t take any breaks at all. If you don’t want to waste your time when you study, you should begin exploring how your brain learns best. For example, did you know that spacing out your study sessions allows your brain the time it needs to soak in new information? 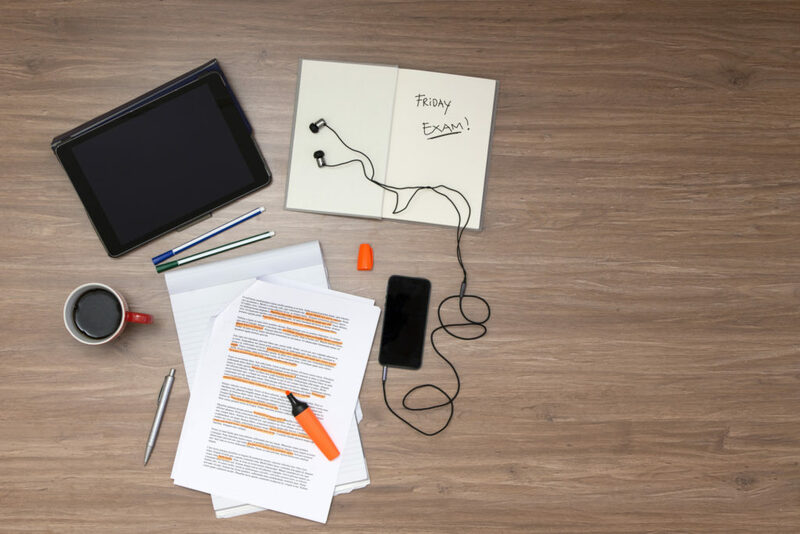 Read on to learn about five study hacks that can help you get the most out of your time and soar to the top of your class. Before you begin altering your study routines it can help to know what your desired outcome is. Setting long term and short term goals will help you stay motivated throughout the school year. For a long-term goal, there’s this article by the Honor Society about how to become a valedictorian. Or maybe you have a long-term career goal you want to start preparing for. If you don’t know your academic or career goals you can always set your sights on financial rewards like scholarships to help cover your tuition costs. Find out what motivates you, write it down and place it somewhere you’ll see it every day. Having a reminder about why you’re working hard will help keep you on the right track. Study hacks are simple, small changes you can make to your learning routine. Because these changes are small and simple you can implement them immediately into your study sessions. Next, we’ll look at how music can help improve your concentration. Do you like to listen to your favorite music when you study? Your favorite songs might be great for activities like driving or working out, but they aren’t always helpful when trying to study. Instead, you should try finding playlists to help you focus. If you find yourself having a difficult time concentrating you might need to turn off the tunes. Researcher Nick Perham suggests that listening to ambient sounds can help prime your brain for learning. In his study, he found that sounds like white noise or soft conversations can help you retain information. You might find that some days you do well with music while others you enjoy ambient sounds. Be creative when choosing the sounds you play. If you like music, challenge yourself to listen to a new station every week. If ambient sounds are your preferred choice than try switching up the background noises you choose. You can try listening to different nature sounds, crackling fires, medieval festival music and more. Have fun and think outside of the box when choosing the sounds for your study sessions. If you’re home you can definitely enjoy a good study session wearing your pajama bottoms. However, if you’re out in public, try dressing for success. Dress in an outfit you would wear to go on a lunch date. You want to feel and look your best when you are trying to learn. If your schedule doesn’t allow you time to prepare a study outfit than you can make dress up your accessories. Buy yourself a quality pen that you only use during your study sessions. You can also have a special binder, notebook or briefcase you only break out for study material. Having these items will help empower you on your mission to learn. Just the very sight of your study pen or notebook will help your brain know it’s go time. Make sure the items you use are special to you. They don’t have to be expensive, accessories but rather ones that have a special meaning to you. Find a notebook with an inspirational quote on the front, your favorite cartoon character or puppies to help customize your learning experience. When choosing a study pen or pencil try thinking outside the box by buying silly or zany writing utensils. A pen with a fluffy end or a pencil with a giant fruit eraser will help take the seriousness out of studying. When you’re having fun your brain will release a shot of dopamine. To be successful, go easy on yourself. Overthinking and stressing yourself out won’t help you achieve your goals. When you’re in a positive state of being your brain releases dopamine into your system. As a result, you’ll experience pleasure and happiness. Making your study sessions light-hearted and fun helps train your brain to love learning new material. So how can you make even the most boring material fun to learn? There are many different tricks you can use to help your brain find it’s happy place. One way to engage your mind is to change your study surroundings. If you’ve been trying to figure out how to get better at school, the answer may lie in leaving the school setting when you study. Your mind learns to filter out familiar background sights, smells, and sounds. When you always study in a familiar setting your mind doesn’t feel the need to focus on what you’re doing. Changing your surroundings challenges your mind to assess new sights, smells, sounds, and experiences. Your brain will wake up in your new surroundings and be ready to learn. You shouldn’t be relying on sugary drinks to fuel your study sessions. One of the best study hacks of all is to drink water and eat foods that help your brain function. Blueberries, broccoli, pumpkin seeds, and oranges are all great brain enhancing foods. You can also focus on eating foods that will set well with your digestive system. Foods like mangoes, yogurt, and papayacan all help improve your overall health. When you’re healthy and happy learning will be much more exciting. My Zeo is happy to help provide you with informative articles about health and fitness. Our goal is to help you find a healthy balance in life by staying fit, relaxing and most importantly being happy. Did you know that finances can be one of the biggest stressors in life? Check out our five stress-free money saving tips that you can start using right away.